To make up for not posting an image last week, I’m offering a bonus photograph this week as an apology. This also allows me to commemorate the destruction of the Seal Beach pier on this date in 1983. This aerial shot taken in the afternoon of March 4. 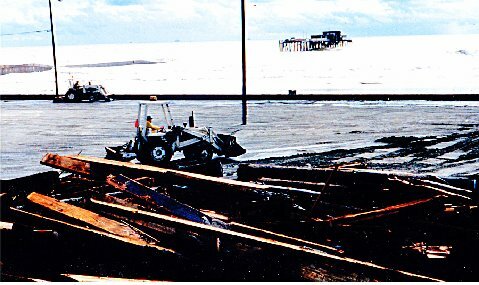 1983 shows the devastating results of the March 2 storm that took out the center section of pier. This same storm also wiped out Island Esther, a man-made island that Chevron Oil had built three-quarters of a mile from the Seal Beach shore in 1965. A Coast Guard spokesperson told the L.A. Times that “about all that’s left is the makings of a good fishing reef.” Chevron would later convert the remains of Esther into an oil platform raised 50 feet above the water. You can find an amazing shot of a swell breaking over Oil Island Esther on March 1. 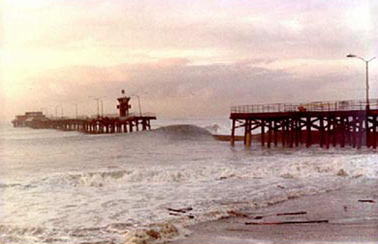 1983 and more dramatic photos of pounding Seal Beach surf at Surfline.com. What many people don’t remember today is that the pier had already lost a big chunk earlier in the year during a big January 27 storm as shown in this photograph. During this period, I worked at The Bookstore on Main Street. I remember walking to work along Ocean Avenue to Main Street after the January storm and encountering a growing crowd at the base of the pier gathered to view the damage firsthand. Some of the crowd were locals, but most of them were out-of-towners drawn to Seal Beach by on the scene television reports from local news personalities. The remaining portion of the pier was unstable and vulnerable to the rough waters smashing into the beach, and there seemed to be a sense of eager anticipation of more destruction from much of the crowd. I felt an instant stab of visceral resentment towards the crowd and what I perceived as their gleeful enjoyment of the devastation. How dare they turn this loss into a vulgar party? This was my pier! How many times had I walked that pier with friends, family and dates? And now it was gone, all gone. What was mere spectacle to them was very personal to me and anyone else who had lived in Seal Beach. It was a beloved part of our lives, and now it was mostly rubble and debris scattered along the beach. Today I’d like to believe I’d be more understanding. Look at that picture. It was a spectacle, and it’s not fair to blame people for wanting to experience the thrill in person. Soon after the March 2nd storm, the tv news vans and reporters left, and the crowds went with them. The Seal Beach community quickly came together to raise funds for the rebuilt pier that still stands today (in spite of some minor damage and the occasional fire). I still miss the old pier, though. Addendum: Here’s an extra image of the damaged pier taken from the west parking lot by Libby Appelgate. If you have any fond memories of the pier that you’d like to share, we invite you to leave a comment. We’ll share more historical pictures and photos of Seal Beach as the year progresses. Be sure to check back every Monday for a new Seal Beach image. 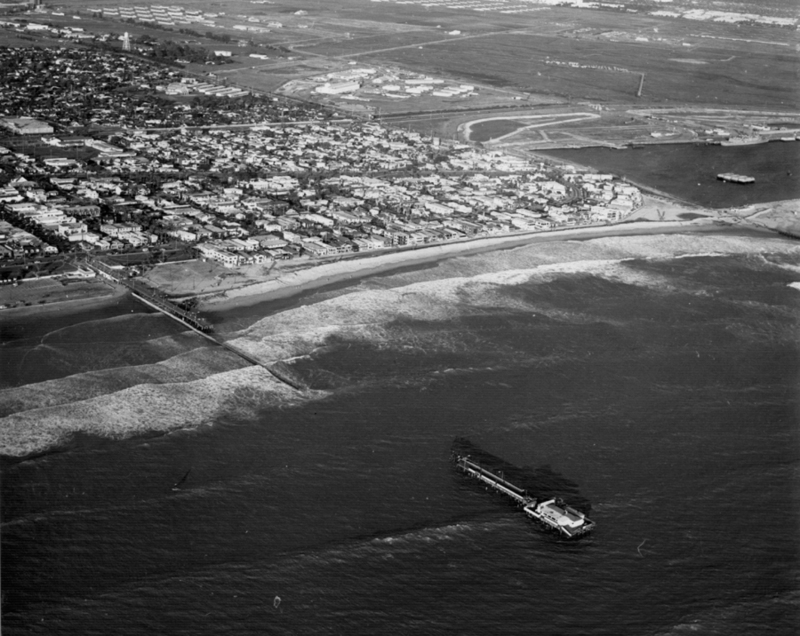 This entry was posted in Seal Beach History and tagged Island Esther, pier, Seal Beach, storm. Bookmark the permalink. I remember this day too….I even have some photos. Wish I could post them here. I work at McGaugh and have shared my ‘broken’ pier photos with some current students and they just can’t believe it! We’re quite open to posting Seal Beach photos from anyone who wants to share. I’ve sent you a private e-mail for details, but I invite anyone reading the blog to share comments or contact me to make arrangements for your own posts on Seal Beach. I would love to see the pics if you could e-mail them to me. I would really appreciate it very much. I hope you can help me locate a photo from this storm in Seal Beach. It was taken during the storm from a helicopter and when viewed closely there are 4 boys in the water “surfing” during the storm. My friend was one of those crazy boys in the water that day. He told me a copy of the picture was displayed in a restaurant somewhere near the pier until just last year. It is now gone. I would love to find this picture and make a print for him or purchase the original. Any help in finding this picture would be greatly appreciated. Sorry, but I’m not familiar with the photo you’re describing. I have two aerial shots taken within seconds of each other,one of which is used in this post, but neither one has surfers in them. If you can get some more information, like the actual name of the restaurant where it used to be, there’s a slight chance it might be possible to track it down. Another possibility is contacting the Seal Beach Historical Society, but the current board tightly controls use of the images in their archives. Perhaps one of our readers might know the photo or have some suggestions. Let us know if you can come up with more information.